An entertainment environment has a user with a faux light saber that interacts with a drone flying through the air or operated with hidden rods to appear as if its flying through the air. The faux light saber has LEDs attached thereto to provide IR light to the drone. As an LED is turned on, an invisible light sensor built into the drone captures an image of the field of view with a bright spot at the position of the activated LED. A visible light source built into the drone then projects light through particulate matter toward the faux light saber. 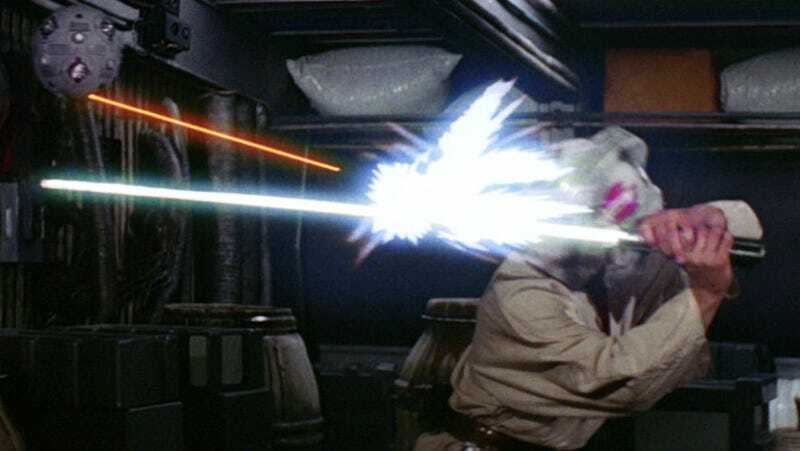 As a result, the uses is provided with the illusion that the faux light saber has deflected a laser beam. Multiple LEDs can be activated in sequence at various times to give user the impression that the movement by the users of the faux light saber is deflecting multiple laser beams. That’s a lot of technical nonsense but it’s basically saying, using this system, park attendees can deflect beams with their lightsabers. Drones will send light through matter (fog or something) so you can see it, and then the sabers will send it back. No matter what, this is insanely cool. The only thing that could be cooler would be if Disney figured out a way to get pure light to grow out of a metal hilt at the touch of a button and stop midair. But this is a start.